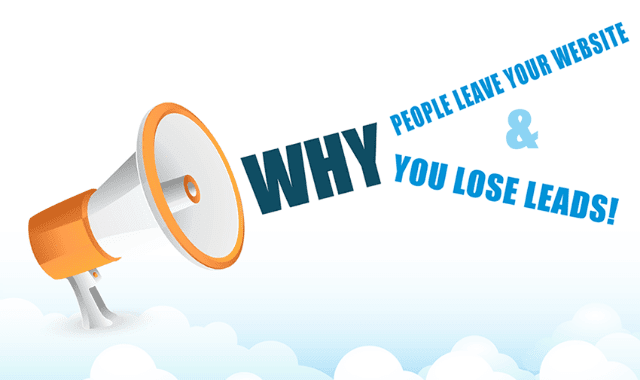 Why People Leave Your Website and Why You Lose Leads #Infographic ~ Visualistan '+g+"
You could lose up to 66% of customers if your website isn’t visually pleasing and another 38% will ignore your website altogether. A lack of clear message will drive away, 46% of browsers. Don’t forget contact details, because unclear or missing contact information can make you forego 44% of leads. The content is equally important, 15% will leave if the text of your website is tiny and poor content can lead to a loss of 44% of customers. Animated ads are another no-no as it will lead to the loss of 42% of customers. Long story short, all of these data (and packaging options like infographics) alludes that it is time for you to pay attention to your website. Give the customers what they want, have a crisp design, clear purpose and make your contact information visible. With all this in place, you surely will have time for quick product selection and quick response, which is what the customer exactly wants!